In Australia, limited awareness of dementia in people from culturally and linguistically diverse (CALD) backgrounds often results in delayed diagnosis, poorer prognosis, and a higher burden of care on families and health systems. Moving Pictures, an innovative multi-media project, aims to change this through the production of 15 short films co-produced with people from Hindi-, Tamil-, Mandarin-, Cantonese and Arabic-speaking communities. For each language, there are three films: Detection and Diagnosis, Navigating Care, and the Carer Journey. These films are based on the stories and lived experiences of carers of people living with dementia, and the expert views of key service providers. Researchers from the National Ageing Research Institute and Curtin University have collaborated closely to recruit and video interview 57 carers and 19 Key Service Providers across Australia, develop the films, a hard copy resource for each of the communities, and the Moving Pictures website (www.MovingPictures.org.au) which is mobile-optimised and will host the films, the hard copy resources and provide links to essential services and organizations for CALD families and carers. The final products of the project will be officially launched at an event to be held in March 2019. • Smart Cities and Communities. 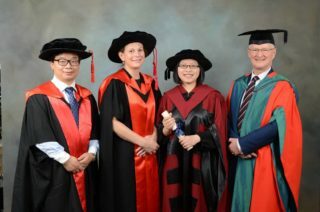 Format: The 2019 China-Australia U40 Summer School and Conference will be held at Curtin University from February 20 – 22. The theme of this year’s event is Being Digital. Sub-themes include: Digital Disadvantage (Ageing; Disability), Gaming and Young People, Digital Design, and Smart Cities and Communities. The 3-day program provides post-graduate students and emerging scholars from China and Australia with a valuable opportunity to share ideas with leading experts in the fields of digital culture, gaming and design. Opportunities to present research; and to participate in focussed workshops; as well as to be mentored by experts in specific fields form part of the program. Accommodation and lunch will be provided to our participants during the summer school. Submissions from Masters and PhD students; and from Early Career Researchers, carrying out research related to one of the themes of the workshop are welcomed. Note: Successful applicants will be required to submit a research plan (long abstract) within 1,000 words and report the research plan at the summer school. CCAT is proud to congratulate John Kinsella on winning the 2018 Niall Lucy Award for his book Polysituatedness: A Poetics of Displacement. John Kinsella’s book Polysituatedness: A Poetics of Displacement. Published in Manchester University Press’s Angelaki Humanities series, this volume collects a diverse range of Kinsella’s texts that together offer a new theory of place. Expanding his theory of international regionalism, Kinsella develops the concept of polysituatedness to capture the complex way we are situated in multiple relationships to local and global fields of life and language. Kinsella explores the polyvalence of place through a variety of modes: through reflection on his own poetic writing practice and its relationships to place, whether at his home in Jam Tree Gully in the West Australian wheatbelt or from the Cambridgeshire fens; through critical engagement with the writing of others, including the reinterpretation of canonical English literature and the renewed exploration of indigenous and non-indigenous Australian poetry; and through theoretical and philosophical argument. With characteristic verve, Kinsella engages deeply with political and ecological issues of migration and settlement, land rights and mining, restoration and animal life. Through various practices of writing and reading that deepen our understanding of emplacement and displacement, Kinsella makes an original contribution not only to literary fields such as ecopoetics and environmental criticism but also to critical theory and the philosophy of place. 1. Why did you decide to do a PhD? I developed the interest in research during my postgraduate study. However, I was not sure about doing a PhD until I worked as a news editor in Shanghai for a year. At that time, I found the area that I was keen to doing research in – digital culture. The Chinese society was and still is going through a series of transformations due to people’s take-up of digital technology in many aspects of everyday life. The speed of technology upgrade and people’s adoption is unbelievable. As time went, the picture of doing a PhD in this area became clearer and clearer in my mind. So, when the opportunity eventually appeared, I didn’t hesitate to accept it. 2. What did you find most challenging about the PhD process? I think the most challenging part is to make the materials I collected ‘speak’ to me. As a researcher, my assumptions are always challenged by the collected materials. That is when I need to be focused, patient, open-minded and honest in order to quiet down the assumptions and discover through data. It was also challenging to figure out what we want to do in a PhD. Although we need advice from supervisors, it is important we figure this out on our own first. Otherwise the communication with supervisors can be ineffective, even confusing sometimes. 3. What did you enjoy the most? The numerous moments of thinking through a point after discussing with supervisors, attending a seminar or walking on the campus. Sometimes they led to completion of a paragraph or a chapter, but most times they did not. In spite of this, this enjoyment of thinking and ‘tinkering’ makes me believe I have chosen the right path. But they cannot compete with thesis submission, of course. 4. What advice would you give to students beginning their PhD journey? My advice: do not hasten to make conclusions about what you may find through a PhD topic. It is natural that your understanding changes along the journey. The change is also a good sign – you have kept yourself well-informed about what you are researching. Throughout history technology is associated with pioneers, and most of these pioneers have been male. It’s not well known, however, that Ada Lovelace (1815 – 1852), the daughter of the English poet Lord Byron was a pioneer of computing technology. The interesting connection to note here is her relationship with culture, namely, the refined world of the arts. In this project I look at the relationship between culture and technology (or, culture + technology) as it applies to female practitioners in China. The creative industries are used to be considered as ‘lying at the crossroads between the arts, business and technology’; and as technological elements have increasingly come to the fore we have seen a shift to focus on so-called ‘digital creative industries’. 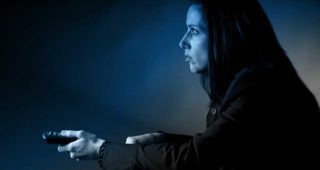 This merging of culture and technology levels the playing field between genders and different income groups. We now see many people, especially younger generations, embracing creativity, digitalization, and entrepreneurism. Research on working patterns in creative sectors also has identified a close relationship between creative industries and entrepreneurship (see also: Baines & Robson, 2001; Higgs & Cunningham, 2008). Entrepreneurs are the key agents in the creative industries, and the quality of entrepreneurship affects the dynamics of this sector(Hartley et al., 2013, pp. 92-93). This study chooses China as the research site. As a sector characterized by artistic, creative, innovative, and cultural, creative industries in China have grown rapidly over the past few years. What’s more important is that China is experiencing a digital transformation, whose speed, scope, and scale of growth and development receive much attention from the world. In order to take advantage of the increasing grassroots innovation in the digital age, for instance the popular Maker Movement, the Chinese government is promoting ‘Mass entrepreneurship and innovation’, trying to develop an entrepreneurial ethos and attract broad participation to gain robust dynamics. In this context, and in response to United Nation’s development goal to ‘achieve gender quality and empower all women and girls’, I look at the female participation in digital creative start-ups and the emergence of female entrepreneurs in creative sectors, to identify their practices. This thesis will thus make a contribution to the knowledge of the creative industries, and will advance our understanding of the dynamics and structures that allow gender diversity, an innovative culture and entrepreneurial skills to develop. This book is available in Open Access via an interactive commentary platform developed by MIT Media Lab run by MIT Press. Can 13 authors, from the USA, Germany, Australia, China and South Africa, many previously unknown to one another, get together and, from scratch, write a 150-page book –– on a topic none of them has tackled before –– in 5 days? We present the results of our work here to the wider community for annotation, commentary, constructive criticism and engagement, with a view to extending the collaborative spirit further. We want the book to gain further analytical richness and precision from crowd-sourced expertise. You are invited to join us as we work through some of the issues that may enable or stand in the way of socialising knowledge itself. Visit the London School of Economics and Political Science blog site for further information. Also featured on the European Commission’s Responsible Research and Innovation Toolkit. “We really missed opportunities when we transitioned from analogue to digital television,” says Associate Professor Mike Kent, the Acting Head of Curtin’s School of Media, Creative Arts and Social Enquiry. Read the full interview. For more information visit Audio Description Discussion in Australia website. 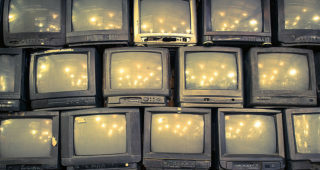 In 1978, humanities scholars worldwide were profoundly affected by the release of Reading Television, a book by UK Professors John Hartley and John Fiske, who had drawn on the new sciences of semiotics and linguistics to analyse how TV was playing such an important role in Western culture. The book challenged the dominant thought of scholars at the time – that TV was not worthy of cultural study – and went on to have an astonishing impact, catapulting both professors to research fame and helping to establish television studies as a new field of research. In celebration of Reading Television’s 40th anniversary, we chatted to Professor Hartley, now the cultural science program leader for Curtin’s Centre for Culture and Technology, a Member of the Order of Australia and a John Curtin Distinguished Professor, about his memories of writing the book, his thoughts on its impact and his current research. To read the full interview follow this link. 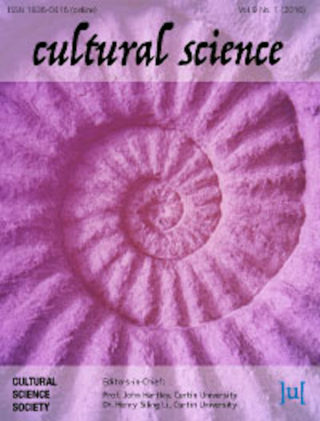 Our very own Cultural Science Journal has been re-launched! CCAT Adjunct Researcher A/Prof Burcu Simsek started working as a media expert and researcher in the “Inclusive Early Childhood Education for Children with Disabilities” Project that is a European Union Funded research and implementation project that will be conducted by UNICEF in cooperation with Ministry of Education in Turkey in 2017-2020. 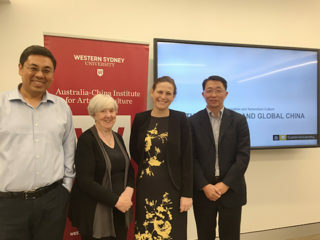 On 2-3 November 2017, CCAT Director Lucy Montgomery delivered a well-received research seminar at ACIAC, Western Sydney University. She was joined by CCAT Adjunct Xiang Ren on a panel discussing open knowledge and publising. Full article here. Tama Leaver with Tim Highfield (MCCA) Instagrammatics and Digital Methods: Studying Visual Social Media, from Selfies and GIFs to Memes and Emoji. 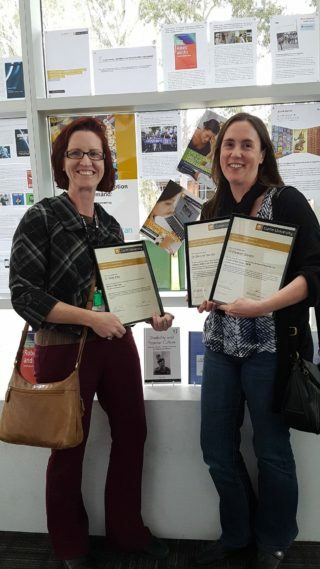 There was also a HDR Research Poster competition, where prizes were awarded for the poster that best showcased aspects of a Higher-Degree Research Project. CCAT’s PhD student Shanshan Liu won the People’s Choice Award, with her poster titled “Visual Social Media Vernacular Responses to the environmental Issues in China”. Well done Katie, Tama and Shanshan! 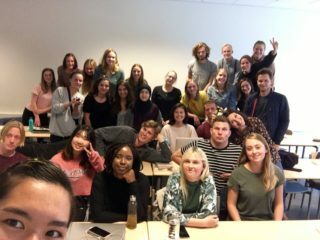 From 31 July to 11 August 2017, CCAT Adjunct Research Fellow Dr Crystal Abidin was invited to be Guest Professor at the “Digital Living: Identities and Complexities” Summer School at Aarhus University in Denmark. As an interdisciplinary course open to students in Aarhus University and abroad, Crystal drew on her expertise to run seminars and give lectures on topics including Internet Celebrity, Internet Antagonisms, and Internet Paralanguages, among other digital media topics. The course was well received by 27 international students and future collaborations with the School of Communication and Culture, Aarhus University are in the works. In June the École normale supérieure in Paris hosted the symposium Field Philosophy and Other Experiments. The symposium drew on contemporary work in the environmental humanities, multispecies studies and philosophical ethology to ask what “field philosophy” might be or become. Participants included Dominique Lestel, Isabelle Stengers, Vinciane Despret, Thom van Dooren, Michelle Bastian, Hugo Reinert, and CCAT’s own Matthew Chrulew and Anna-Katharina Laboissière. Organised by Brett Buchanan with help from Dr Chrulew and others, and supported by CCAT, the Edinburgh Environmental Humanities Network and Laurentian University, Field Philosophy was a productive opportunity for interdisciplinary exchange and experimentation. A journal issue arising from the symposium is being edited by Drs Buchanan, Chrulew and Bastian. ARC Indigenous Discovery – $312,400 – Prof Kim Scott – Mobilising song archives to nourish an endangered indigenous language – Sydney University – 2017-19. Congratulations to all involved on an amazing effort! 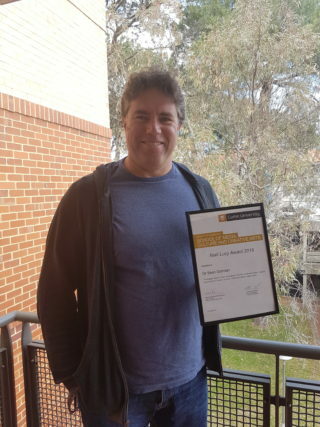 CCAT is proud to congratulate Dr Sean Gorman on winning the 2016 Niall Lucy Award for his work on racism in Australian sport. The Niall Lucy Award, which includes a $5000 prize, recognizes excellence in publication in any area of Critical and Cultural Theory; Media Scholarship or Popular Music Scholarship. The award, which is sponsored by the school of Media, Culture and Creative Arts, was created in 2015 in memory of CCAT co-founder Professor Niall Lucy. 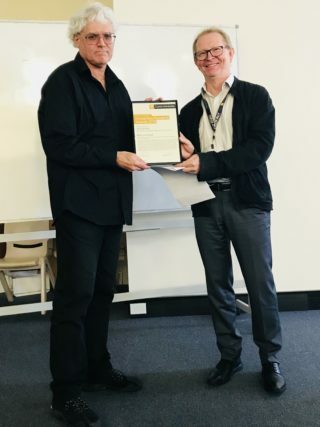 Dr Gorman authored a Special Issue of Sports in Society: Cultures, Commerce, Media, Politics with Dean Lusher and Keir Reeves, titled “The Biggest Game in Town: An Analysis of the AFL’s Vilification Policy”. The special issue is one of the outputs of an Australian Research Council Linkage project examining Indigenous and multicultural diversity and masculinity in the Australian Football League: a project that has provided the AFL with key recommendations for improving the quality of education programs dealing with diversity across the sport. In 2015, the Award was won by Dr Matthew Chrulew for his outstanding contribution to the field of philosophical ethology. Once again CCAT Researchers stole the show at the annual Humanities Research celebration! Their wins are testament to their energy, commitment and talent – and we couldn’t be prouder. Dr Katie Ellis took home the prize for Book of the Year for Disability and Popular Culture (Routledge, 2015). Dr Eleanor Sandry’s book Robots and Communication (Palgrave, 2015) won the faculty’s award for Best Book by an Early Career Researcher. 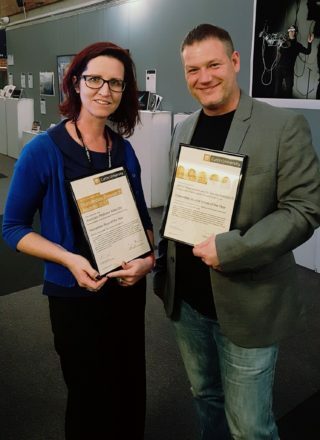 Dr Sandry also took home the prize for Best Journal Article by an Early Career Researcher for her article “Re-evaluating the form and communication of social robots: the benefits of collaborating with machinelike robots”. Dr Matthew Chrulew took home the award for Best Book Chapter by an Early Career Researcher for “Genealogies of the Secular”. He also won the prize for Minor Creative Work of the Year (Early Career Researcher Category) for his short story “The Mamontogist’s Tale”. 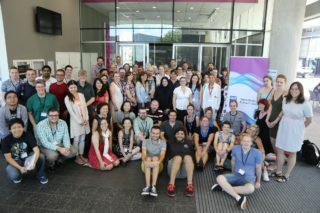 On 15 February 2016, Alkim Ozaygen and Shanshan Liu joined the 2016 Digital Method Summer School hosted by Queensland University of Technology’s (QUT) Digital Media Research Centre at Brisbane. It was a week-long programme and provided an opportunity to learn vital research skills and develop networks with others in the social media research field. Both enjoyed exchanging opinions and sharing knowledge with people from different countries during the week. 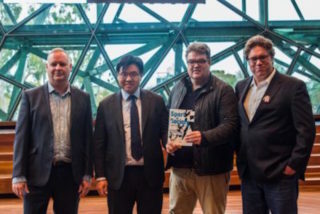 Dr Sean Gorman’s latest publication The Biggest Game in Town was launched at Deakin Edge in Melbourne’s Federation Square on the 25 May 2016. The, book, which was co-authored with Dean Lusher and Keir Reeves, reports on the findings of an Australian Research Council ‘Linkage’ project led by Dr Gorman. The project examined the Australian Football League’s Rule 35: the first code of conduct in the world to be introduced by an elite sporting organization to deal with racial, religious and sexual vilification. The book begins by exploring Australian social and sporting history, before going on to present case studies of nine complete AFL clubs. The MC for the launch event was well known sports writer and historian John Harms. Speakers included Brett Johnson, the general manager of player development at the Australian Football Players Association and Mr Chin Tan, Director of Multicultural engagement at Swinburne University.